I find last week’s news that facebook has reached the milestone of 500 million subscribers interesting for several reasons. Firstly, the idea of the social network plays a role in reinforcing the idea of networking as the central motif through which contemporary life is understood. That is to say, it is common to draw upon the idea of the network – an interconnecting together of disparate nodes, a braiding of otherwise separate strands into a net – in order to understand global life in the contemporary era. This image gives the impression of organised interconnections between nodes laying in a criss-cross pattern across the globe. Whether or not this actually happens (and there is evidence that infrastructure connects certain points leaving dead space in between) is perhaps less important than the manner in which this motif acts as an organising principle for our attempts to understand and imagine what it means to live life on a global scale. What is at the heart of this motif? As David Harvey noted, one of the important things underlying the idea of networking is time-space compression – the reduction of perceptions of spatio-temporal distance between places and people by improvements in transport or technology such that otherwise distant points feel bound together. But something else is, I think at the heart of the idea of the network: relationships and exposure. The interconnections made possible by time-space compression foster relationships between places and people that might otherwise have been rendered weak by distance. More importantly, they render possible all sorts of projection across space and time that means people can send ideas and communications to those they might not otherwise know. And such a sending necessarily exposes the sender to the possibility of misunderstanding and/or rejection. Of course, the hope – at the heart of the social network – is that strong relationships of time/space and exposure will coincide in a good way: that we will send communications to unknown others and, felicitously, forge authentic relationships as a consequence. But this brings me to the second thing I find interesting – facebook captures the duality of community in modern politics. On the one hand it is home to plenty of groups of people who profess some sort of common identity. These ‘communities’ recreate the same sort of inclusionary dynamic found in modern political community. They seek to be a group defined by some sort of common property or project. But there is also another kind of communit at work here – the community of those who, as Alphonso Lingis once said, have nothing in common. In the networked world one cannot – without rejecting the motif that makes sense of the world for most people (and thus making it hard for you to find common conceptual ground on which to have a conversation about the world) – refuse interconnection. It is not possible to refuse a potential relationship. That is, we are all exposed in some way. From the call centre worker taking calls from unknown customers to the academic with publicly advertised email addresses to the adverts piped in unwanted by Google AdSense to each webpage you view, there a myriad ways that we are exposed to communications we may not have solicited, each seeking an interconnection in some way. Of course, one can try to limit these interconnections, but there is always that chance that someone not the same as us tries to connect with us. As such then, the social network shows very well how communities of commonality are always – in the words of Jean-Luc Nancy – unworked: picked away at by attempts by those who are not the same as us to connect, connections that would show the artificial notion of ideas of commonality (i.e., that such closed communities rest on constructing a sense of sameness and keeping otherness out). Thirdly, social networks rely on real infrastructure. The concentration on social relationships is a classic case of anthropocentrism. While we concentrate on the way that social networks make human relationships possible, we forget that the people engaged in these relationship are cyborgs: assemblages of machine and flesh. Without keyboards, webcams, fibre optics, routers and so on I, you or we would not be what we are. As such then concentrating on social relationships has the effect of masking the way that the very nature of human subjectivity has been changed by networked technologies. And finally, there is a very pronounced politics to infrastructure. 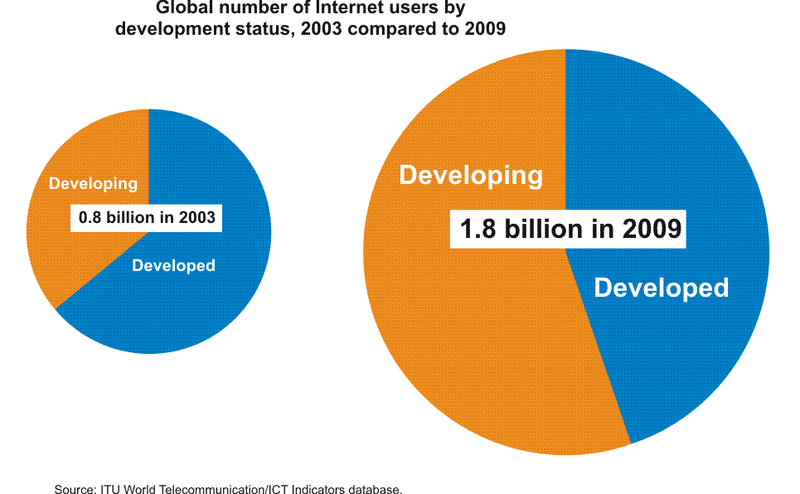 Although there are more internet users in the developing world than in the developed world, this tells us nothing about the actual penetration of internet infrastructure in the developing world (rather it tells us that there the population of the developing world is bigger than that of the developed world – hardly an amazing fact). If one turns to the geography of users of facebook (and other social networks), one begins to see the pattern of internet penetration. And most notably, one finds that Africa is the most common cold spot when it comes to both social networking and internet penetration. As such then the networking characteristic of global life is as uneven as the political economy that also defines our time. It is worth remembering then that while the network may be a powerful motif for understanding and envisioning the contemporary period, we should not lose sight of the geopolitics of infrastructure evident in its uneven distribution. This entry was posted on Friday, July 30th, 2010 at 15:53	and is filed under Comment. You can follow any responses to this entry through the RSS 2.0 feed. Both comments and pings are currently closed.